Stocks have been in an uptrend for more than five years and the Dow Jones Industrial Average has more than tripled since 2008 lows. Smart investors are getting nervous as they realize that no market goes straight up forever. The question now is not if but when will the next bear market in equities occurs. It does not take a PhD rocket scientist to observe the record gains in the US stock market for a lengthy period of time without any major corrections. It begs the question is any of this through the use of record low interest rates and quantitative easing since the start of the credit crisis to achieve this? I am concerned that these gains are overinflated and pumped higher through these policies of the Central Bankers and stocks are way overvalued and extremely overbought, not reflecting the real economy which to me is the worst it has been in a long time. Unemployment still remains high, small business growth is almost non existent and government spending remains out of control. Interest rates are going negative and the appetite for precious metals is rising. I believe the Dow-Gold ratio is about to turn in favor of precious metals in a big way. I am focussed on mining companies that are backed with assets rather than pipe dreams like so many tech stocks. While the lemmings were chasing stocks in 2015 I continued to build positions in deeply discounted mining companies with near term production, top notch management teams and in mining friendly jurisdictions. Now in 2016 although stocks remain high, the miners have outperformed. This may be just the beginning because I expect even greater capital rotation into precious metals and junior miners when stocks begin crashing. The Fed raising rates could be good for precious metals as investors may finally rotate out of overvalued stocks in search for equities backed by precious metals or gold silver exploration which has finally turned the corner. Interestingly, since the Fed started raising rates at the end of 2015 the junior miners have had a huge uptick in price appreciation indicating a lot of capital coming into the junior miners. I expect great gains especially as we may have ended one of the deepest and longest downturns in the mining sector ever. It appears that gold broke its downtrend and 200 Day Moving Average in early 2016 forming a bullish golden crossover in February. 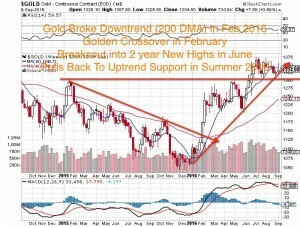 Then in June gold broke 2 year highs and has since consolidated to the breakout point at $1300. Its quite normal after making such bullish breakouts to hold at that level before the next leg higher. 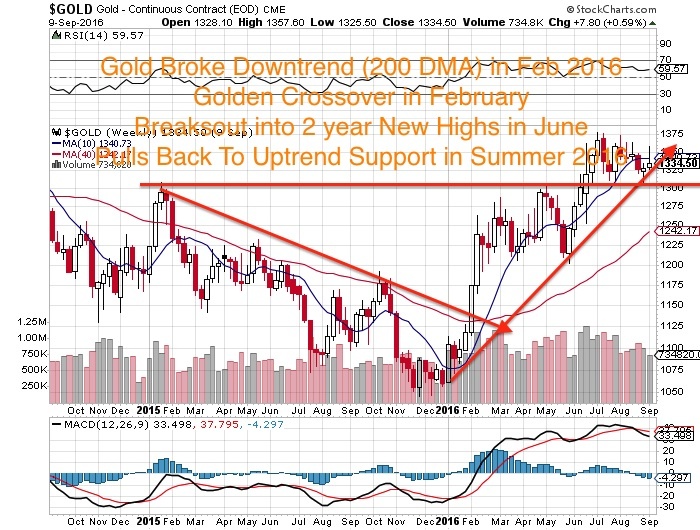 This summer gold has taken a breather pulling back to uptrend support. It may still base until the Fed decision next week providing what may be looked back upon as a secondary opportunity for those who missed the Brexit breakout in June. 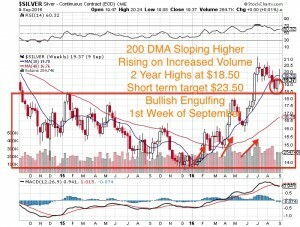 Gold and silver both have rising 50 and 200 day moving averages which are bullish showing an upward trend. Notice rallies have been on increasing volume showing possible accumulation. It broke out into new 2 year highs in June following Brexit and has since consolidated returning to the breakout point. 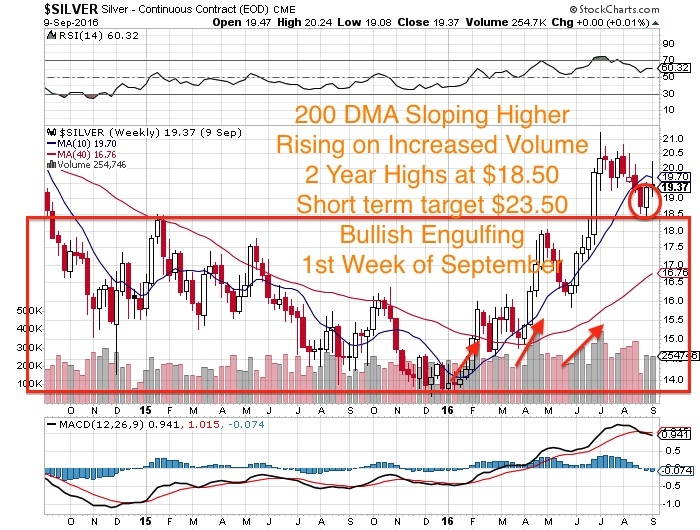 This past week it made a weekly bullish engulfing pattern which may signal a short term reversal to the breakout technical target of $23.50. The move may accelerate higher after the Fed announcement next week. Now during this pullback in the junior miners follow these three companies who may be on the verge of a re-rating either through discovery or development. They could be takeout targets as they move closer to production for a mid tier producer who is falling short on gold reserves. 1)Take a look at this junior gold miner in British Columbia on track to produce a Feasibility Study in early 2017 and start construction by the end of the year. There are very few high quality near term gold producers hitting these results in Canada. More than 65% of the shares are in strong hands led by Osisko and Premier Gold. Their recent results were quite exciting. 2)Another junior gold mining company in British Columbia has a Mine and Mill Complex which they plan on reopening in the near term. They just received a water discharge permit to begin geotechnical test work. New management that came from Goldcorp appears to be rapidly putting together a team for permitting and the eventual restart of the mine and mill. Over $80 million was spent on mine development and expansion from prior companies. For a deep discount this junior acquired 100% of the whole plant, camps, permits, bonds and a estimated tax loss pool of around $50 million. 3)This junior gold miner led by one of the smartest mining executives in the business acquired one of Barrick's top gold mines at what could be seen one day as the bottom of the bear market in gold mining. They bought it for a huge discount to what Barrick paid. This mine was a prior producer and contains high grade gold. The company announced recently that the re-start process is well advanced, on budget and on time and that they started a drilling program targeted at resource growth. Unlike many junior gold miners this company was fully financed when it started trading but raised an additional $18 million which will allow them to build an underground decline and for expansion drilling. This has led the company to hire full time PhD exploration manager who has experience in the jurisdiction as he worked for some of the majors. Further drilling could be exciting as it is a first class deposit in a jurisdiction which has monster mines. The CEO is well thought of with four decades of mine building experience and has been involved with eight mine restarts. He has sold a prior junior company for billions and worked for the majors. I am quite excited to hear some of the results coming from the drilling at this former Barrick project. Disclosure: Jeb Handwerger owns these three stocks highlighted and the companies are all website sponsors. Owning securities and receiving compensation is a conflict of interest as I could personally benefit from a price/volume increase. Please do your own due diligence as this is not financial advice!